Things we lost – Justin’s Swiss Army knife (left in carry-on luggage accidentally and TSA took it) and Ashley’s fleece on a bus in Valparaiso. 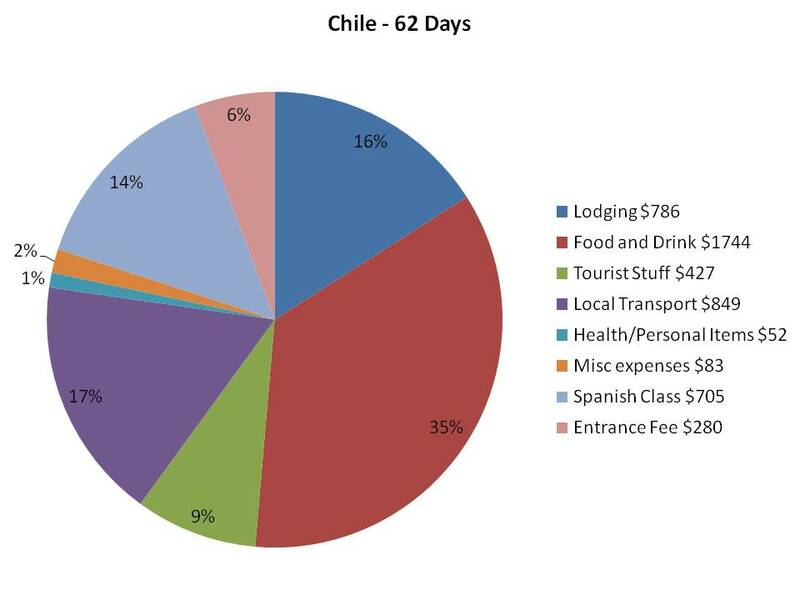 We had 2 big expenses in Chile that really bumped up our spending. 1) $280 ($140 per person) reciprocity fee for flying into Santiago. You can avoid this by bussing in. 2) We took a few weeks of Spanish classes that cost us $705 total. Chile isn’t the cheapest place to take classes, but it was where we had the apartment and the time to do it, so we think it was very much worth it. Our Spanish was pretty terrible at the beginning of our trip, and while it’s still not excellent, it’s much improved. At this point we are able to understand others, and make ourselves understood in most situations, including social situations. We went to Escuela Bella Vista and were very happy with them. We had very small classes (the first week was just 3 of us, the second week we had 5 all together) and each week we had 3 different teachers, which was great since each of them had a different style and spoke a little differently. We’d highly recommend this school if you are in the area and looking for a class. They can also arrange home-stays and apartments, even for as short as a week, if needed. *This is a little skewed because for 5 weeks we were fortunate enough to be staying in a friend’s apartment and didn’t incur lodging costs. If we average the cost for just the 25 days we paid for lodging it ends up being $31.46 per night. 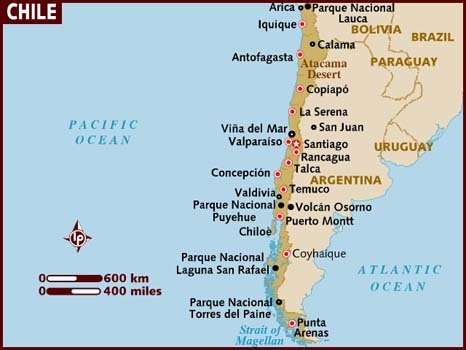 Rooms in Chile are expensive compared to Peru, especially in Patagonia. In larger towns we’ve managed to find hospedajes where we can have our own room for the same cost as staying in a hostel dorm. In Patagonia we didn’t have as much luck with this strategy, and as a result we ended up spending most nights in a 6 bunk dorm room. Most expensive lodging, per person – The Erratic Rock, Puerto Natales, approx $18.50 per night for a shared dorm. We could have stayed somewhere cheaper, but the Erratic Rock is locally famous for their hearty breakfasts (Omelets! Homemade bread and jam!) and helpful explanations for trekking in Torres Del Paine. Least expensive lodging per person – Campsite at Refugio Chileno in Torres Del Paine, $9.75 for one campsite with 2 people. Average food/drink cost per day (per person) – $14. 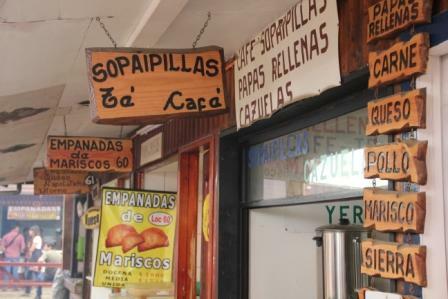 * In Santiago we predominantly cooked at home, though we did eat out for lunch most days while we were in Spanish School. We had a few nice dinners out, but generally we found the food in Chile to be ‘meh’. Most places we’ve stayed in had well-equipped kitchens, which make it easy to stay in and socialize with everyone else who is cooking in. We drank a LOT in Chile. We bought a lot of wine and beer at the supermarket, went wine tasting outside of Santiago, and had a few debaucherous nights on the town that really increased the daily average in this category. Adolfo’s in Futaleufu. It’s an actual house complete with a living room furnished with super comfy overstuffed furniture, cable tv and a maid who makes scrambled eggs to order as you sit down to breakfast. They have a golden retriever named ‘Gringa’, and another scrappy little pup named ‘Pichhu’ who will loyally follow you around town if you are good to him. A great comfortable place that really feels like home. Casa Aventura in Valparaiso. Lonely Planet doesn’t give it a great review, but it was one of the cheaper places we found (for booking online before we went, you can find cheaper if you go and wander around but we were only there for one night and didn’t want the hassle of walking around looking for a place). They have clearly done some work since the LP review came out and there are sparkling new bathrooms, a nice upstairs lounge area, and huge rooms that are filled with light. The people who work there were very helpful in giving us a route to walk to see the best of the street art, and the breakfast is good with eggs and fresh fruits. My personal favorite thing about this place is that THEY RECYCLE! They have bins set out for paper, cardboard, glass, plastic, and they actually take the time to take it all down to the recycling center. Tiramisu (Isidora Goyenechea 3141) in Santiago. Delicious pizzas! We had great huge salads, real bruschetta, and good wine here. It’s packed at lunch so be prepared to wait for a table. I don’t really know what it’s called, but in Niebla, just outside of Valdivia, there is an amazing market of sorts that is filled with vendors selling empanadas by the dozen, grilled meats, fish, steamed clams and mussels, cakes, pastry, and beer. We stumbled on it randomly while looking for the way to the beach, and were so impressed by the food that we went back…twice! When you get off the bus in Niebla just walk towards what looks like a marketplace and you’ll run smack into it. Delicious Express – Pasaje Galvez 358, just uphill from the Shell station (and just downhill from Casa Aventura) in Valparaiso. 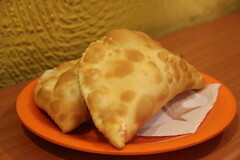 These were easily some of the best empanadas we had in Chile, and they have dozens of fillings to choose from. They are big and made fresh to order. Drink – Mote con Huesillo. So good! It’s sold at little stands on the streets everywhere. 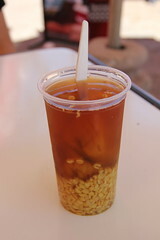 It’s a food/drink of grain and peaches served in the sweet broth it’s cooked in. It’s served cold and is both refreshing and a perfect light snack. The quality varies from place to place, so if your first is sort of ‘meh’, try another one somewhere else. Austral Glacier Travel Agency. BEWARE! They are recommended by the Erratic Rock, which we very much liked, so we let our guards down and were blindsided by a huge overcharge for the one thing we let them book for us. They claim they don’t add commission for their bookings, and they came so highly recommended that we didn’t do our due diligence with price-checking before we put the money down, and we didn’t check that they were using the correct exchange rate for the currency conversions from US Dollars to Argentine Pesos to Chilean Pesos. Stay far, far away from this dishonest place.